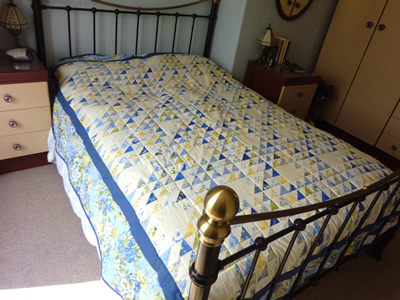 Size: Double bed sized quilt measurements: 72" x 92"
Materials: Top and Backing 100% cotton. Batting 80% cotton 20% polyester. Machine washable. Price: £420.00 inclusive of postage & packing. Description: This Quilt is a copy of an early 19th century North American - North by Northwest design Quilt. I have used Moda Summer Breeze collection of fabrics which I think gives it a lovely light springlike appearance.